It’s beginning to be a long, cold winter. Lots of snow, wind, crappy roads, and well, I suppose that’s just winter in British Columbia. I have been getting out with my camera (chasing the light as it were) whenever I can and just having fun photographing as many different subjects as I can. Sometimes, however, I have to remember to make a living. 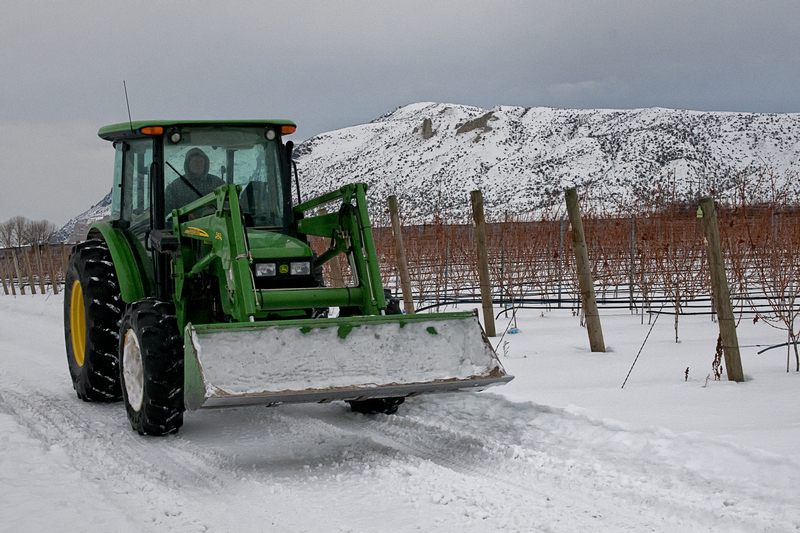 So I packed up my camera and flash when I received an email from the owners of a vineyard I have been photographing since spring reminding me it was time to get pictures of the seasonal pruning. I have written about my excursions in the winter snow, but on those I could take my time. I would wait for, or follow the sun, and when the weather got too windy or too cold all I had to do was go inside. On this occasion I couldn’t do that. The day was very overcast, flat, and gray. The temperature on the high, flat, plain along the river wasn’t painfully cold, but even at minus 5 degrees Celsius the constant wind made fingers and ears uncomfortable quickly. 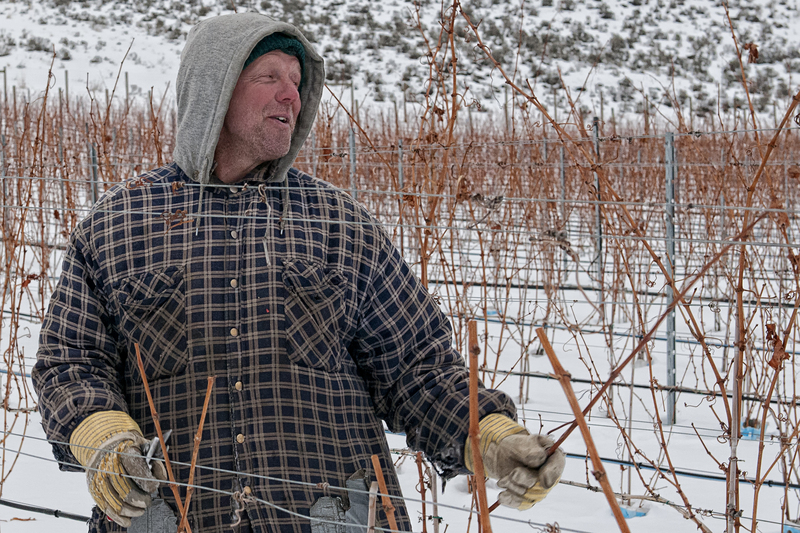 The vineyard workers slogged through sometimes knee deep snow and were all bundled up against the wind and cold as they pruned the acres of vines. My job was to make pictures that were more than just documents of people working at a local winery. I put on my warm winter boots, several layers of clothes, and my convertible fingerless mitts. My biggest problem wasn’t the weather; my concern was the light, or at least, the lack of it. I didn’t want to be limited to a wide aperture. Limiting my depth of field would put foreground and background out of focus, and I wanted vines and/or people on both sides of my subject to be in focus. To compensate, I increased my ISO to 800, selected 1/250th shutter speed, and tried to keep my aperture at F8 or smaller. For any close shots of the vineyard workers pruning vines I had a flash mounted on a flash bracket attached to my camera. I like that bracket. It positions the flash about ten inches above my camera so it doesn’t get shadow from my big lens hood like the pop-up flash, and I can easily move the flash off-camera to light subjects from different directions. I didn’t have to worry about the vineyard people being camera shy because by now they are pretty used to me, and most have an easy smile and are happy to discuss their work and don’t seem to mind me joining into a conversation and even pose a bit to make my pictures better. That’s my style anyway. I’m not one to hide behind a camera. Whenever I am involved in an event I change my position a lot, and am never concerned with getting my clothes dirty or wet. I work to keep everyone relaxed and I quickly lift my camera to make an image, and just as quickly lower it do keep contact with my subject. After the cold, windy hours of photography I hitched a ride on a tractor back to the barn. Those fellows were happy to get out of a long day in the cold snow and wind, returning to their warm homes to relax and pack ice on their sore, right hands. 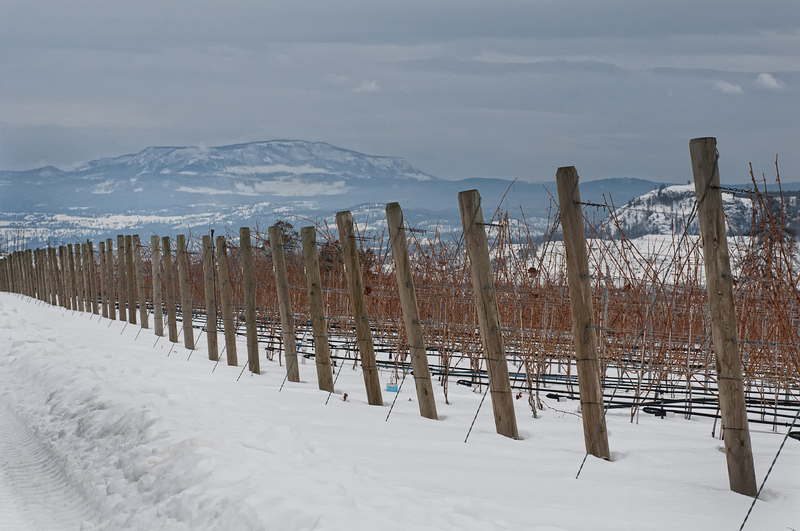 The hours of pruning comes at a cost. For me it was a productive day. And, even though I now have lots of images for my clients I’ll keep an eye on the light for the next week and return to the vineyard hoping to get a few more shots. 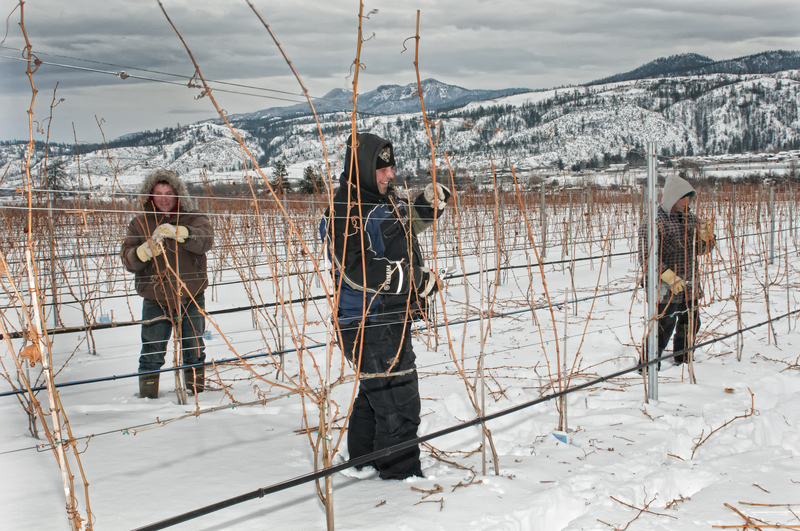 This entry was posted in Photography and tagged british columbia, Cold Weather, off-camera flash, photography, pruning, vines, vineyard, winter. Bookmark the permalink. Thanks Sam, glad ya like my blog. Hi, Interesting project. You mean the first image of the vine fence? Sure add it. Thanks again for the nice picture! Must be hard to shoot in that cold. I love images like this. Thanks Leanne. I just dress warm and wear those gloves that convert from mitts to fingerless. Hey I just checked…you get snow too. Thanks for your this posting. My pleasure and thank you for reading and commenting.